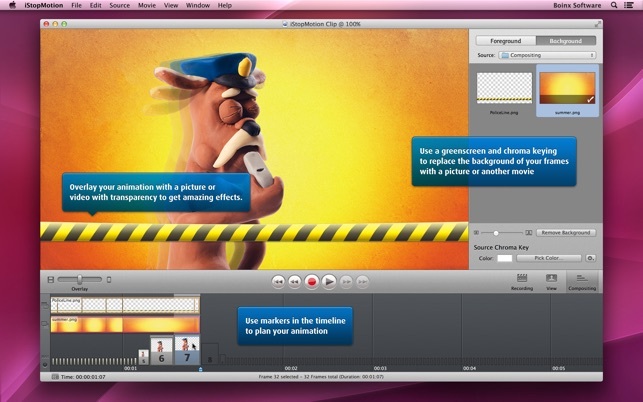 iStopMotion is the award-winning standard of computer-aided stop motion animation (also known as claymation) and time lapse photography for your Mac. It is equally loved by many thousands of parents, kids, teachers, brickfilmers, pro animators and anyone with an interest in this fascinating movie making technique. "To me, [animating with the family using iStopMotion] was the perfect weekend of inspiration and magic and creativity. That's what technology can do." lower, much more affordable, rock bottom price. 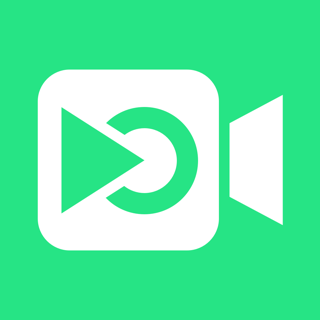 Support for the iStopMotion Remote Camera – Turn your iPhone, iPad or iPod touch into a versatile HD camera for iStopMotion with the iStopMotion Remote Camera app, available free of charge from the App Store. 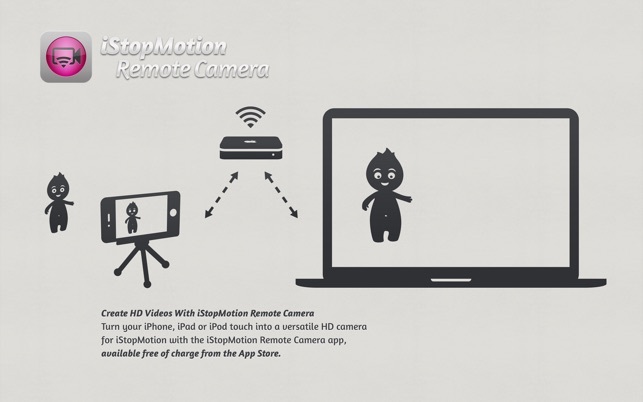 iStopMotion Remote Camera transmits a live video feed and supports 1080p remote capture with the iPhone 4S and the iPad (3rd gen.), and 720p with iPhone 4, iPod touch (4th gen) and iPad 2. Also new: gorgeous new UI optimized for the Retina Display, export to Final Cut Pro X, support for OS X 10.8 Mountain Lion, signed with DeveloperID and sandboxed for enhanced security and more. 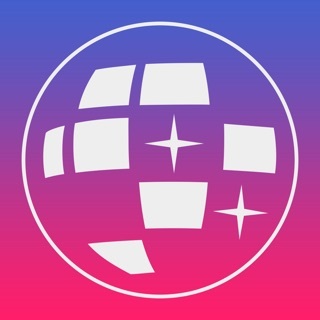 Check the website for a complete version history. Watch your animation before it’s finished to see if it worked out the way you wanted. iStopMotion focuses on and perfects the art of capturing images. 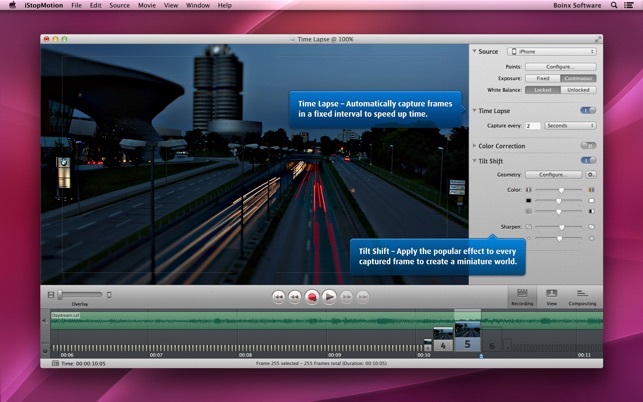 Use any video editing software like iMovie, Final Cut Pro or Adobe Premiere to edit, add titles and sound effects. 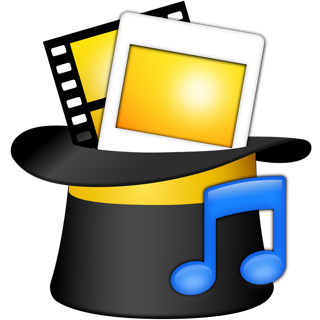 iStopMotion records and stores each frame individually for maximum quality and can export to any format supported by OS X, including Full HD. 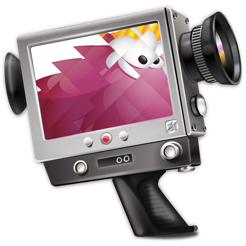 • Make DSLR cameras work on macOS 10.12 Sierra. • Fixed a crash when removing the value from the timelapse time interval input field. • Fixed a crash when closing a document.